Punahou's Miah Ostrowski drove to the hoop against Kalaheo's Cheynne Lishman. For the past five seasons, talented Punahou basketball teams have had to sit back and watch Interscholastic League of Honolulu rival Iolani rack up championship after championship. Maybe that's why this year's state championship game for Miah Ostrowski and Spencer McLachlin just might be a little sweeter. The talented senior duo, who have never been able to lead the Buffanblu over that final hurdle, are one win away from the school's first state boys basketball championship in eight years. Top-seeded Punahou defeated Kalaheo 66-53 last night in the semifinals of the Hawaiian Airlines/HHSAA Boys State Basketball Championships at the Stan Sheriff Center to advance to tonight's championship. McLachlin rebounded from a sub-par six-point performance against Moanalua in the quarterfinals to drop in 17 points and grab seven rebounds, and Ostrowski scored a game-high 22 points. The Buffanblu (24-3) will try to match the accomplishment of the Punahou team that knocked off the Mustangs in overtime of the 1999 state title game. "It feels good to finally get to this point, but we're not satisfied yet," Ostrowski said. "We know we've got one more game to put it all out on the line and accomplish what we've talked about." The Buffanblu didn't qualify for the tournament last season, but first-year coach Dan Hale has put his team in great position. 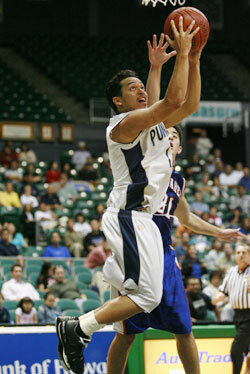 Not only has Punahou not won a title since '99, but it was also the last time they reached the championship game. "I've been fortunate to have two great seniors on this team carry the load and step up for us every time we've needed them to," Hale said. "I just can't say enough about how coachable they have been." Tyler Caswell and Cheynne Lishman each scored 16 points for the Mustangs (24-10), who wouldn't let the Buffanblu run away with the game. Every time Punahou appeared ready to make that final decisive run, the Mustangs seemed to have an answer. "We were able to cut into their leads, but once we got it down under 10, we would turn the ball over two times in a row and it would lead to easy layups," Kalaheo coach Chico Furtado said. "(Punahou) is too good of a team to make as many mistakes against as we did." EIght first-half turnovers by the Mustangs were the keys to Punahou getting out to an early lead. A 15-5 run over the final 5 minutes of the first quarter, including five points off of turnovers in the final 15 seconds, gave the Buffanblu a 19-9 lead after the opening 8 minutes and set the tone for the rest of the game. "We work a lot on our 1-3-1 trap to force them into the corner and I look for the steal on the back side," Ostrowski said. "It's easy for me to jump into the lane and make the steal, but it's my teammates doing all the work." The Buffanblu defense gave up a couple of open 3-pointers by Lishman, who finished with 10 first-half points, but clamped down on the Mustangs duo of Cliffton Pires and Chase Moses, holding them to a combined 0-for-7 from the field in the half. McLachlin had nine points as the Buffanblu got him more looks down low in the post. "It was important for us just to get him established early on," Hale said. "He wasn't necessarily going to get shots, but we wanted him to get into the flow of the game and stay active." Down by 12 entering the third quarter, things quickly got worse for the Mustangs as Moses rolled his ankle in the opening 45 seconds and did not return. Center Tyler Caswell tried to take over, scoring Kalaheo's first seven points of the half. A free throw by Lishman cut Punahou's lead to single digits for the first time since early in the second quarter, but McLachlin answered with the final six points of the quarter to give Punahou a 54-39 lead. A layup by Caswell and another trifecta from Lishman cut the Buffanblu lead to 10, but Punahou always had an answer. KALAHEO--Alika Kaanapu 0, Cody vonAppen 6, Koa Siliga 4, Taylor Jay 0, Larry Soto 0, Keano Bruhn 0, Bruce Andrews 0, Tyler Caswell 16, Cheynne Lishman 16, Chase Moses 0, Aaron Fernandez 0, Cliffton Pires 5, D.J. Chang 0, Deaux Burns 6. PUNAHOU--Robert Toma 0, Miah Ostrowski 22, Kimo Makaula 8, Dane Okamura 2, Kyle Whitford 0, Dalton Hilliard 10, Henry Cassiday 2, Ted Hawkins 1, Sean McFadden 0, Trevor Crabb 0, Kameron Steinhoff 4, Spencer McLachlin 17, Casey Shibuya 0. 3-point goals -- Kalaheo 5 (Lishman 3, vonAppen 2), Punahou 4 (Ostrowski, Makaula, Hilliard, McLachlin).